Heat oil in a heavy stock pot or Dutch oven. Add all the vegetables, except the zucchini, parsley and beans. Cook over high heat for 4-5 minutes, stirring constantly. Add the garlic, curry powder and the bay leaves and continue cooking for 2-3 minutes. Pour in the stock, there should be enough to cover all the vegetables. Bring to a boil and then reduce heat to simmer, cover and simmer for 20 minutes. Add the beans and cook for another 10 minutes. Puree about 1/3 to 1/2 of the soup in a blender. Return puree to the pot and bring to a boil. Then add the zucchini and parsley and continue cooking for another 3-4 four minutes. I didn’t grow up eating fennel bulbs or parsnips, so I am always excited to find recipes that use them. For those new to fennel and parsnips they are readily available at the grocery store. Parsnips look like white carrots and have a delightfully sweet flavor. A lot of people puree (or mash until really smooth) their parsnips. If you have never tried fennel, it has a very light, soft, sweet flavor only slightly reminiscent of licorice. Some people like to eat it raw in a salad but I like it cooked in soups. So far as I am concerned, the absolutely best way to eat parsnips is roasted (like you would potatoes), so beautifully sweet and tender – if you haven’t tried it DO. It might be worthwhile to mention that fennel bulbs are in that “anis” or “licorice” class of flavors. Oh Will! The faint licorice flavor in fennel is so very mild! It is not at all like the black coated candy you get at the movie theater. (Thatâ€™s sort of like comparing Mt Everest to a mole hill!!) If you have not tried it in a while I urge you to be a bit adventurous! One cautionary note: Be very careful puréeing the HOT soup in the blender. Be sure to only fill the blender about 1/3 full and hold the top on with a dish towel. We donâ€™t want the pressure from the steam to blow the top off while the blender is in motion! Or when you are puréeing hot soup in the blender you can open the plug slightly in the cover of the blender to release the steam!! 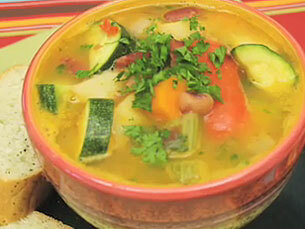 This is one of the best soup recipes I have ever tasted! I had never used fennel before and was somewhat hesitant but all I can say is try it! Wonderful combination of flavors. Be sure to use the parsnip too. Thanks for the great recipe! I’ll be sure to make it again and again! Hi Karen, That’s great to hear! A hot bowl of chunky soup is my favorite meal on a cold winter’s day! I am so glad you enjoyed this recipe! This is just fantastic! Definitely one of the very best recipes I’ve ever tried to make. The blending really does make it wonderfully creamy. It’s so easy to make and so healthy – and yet so incredibly tasty! The best thing for a cold winter night. This is the first recipe I’ve tried from your site and you can be sure I’ll be trying some more soon! Yes, indeed this recipe is a real winner, plus it makes the whole house smell wonderful! Good Luck sampling my recipes – I have over 250 to choose from!